Styes are pimple-like red bumps commonly caused by dead skin, dirt, or oil buildup clogging sebaceous glands outside or inside the edge of your eyelids. Styes are painful but usually go away on their own after about seven to ten days. They are not severe, however, our eye doctors at Valley Eyecare Center recommend the following four remedies to help subdue styes and avoid any scarring related to this condition. Heat Compress: Use a warm washcloth and place it on top of your eyelid—for at least 10 minutes each time. Keep rinsing the washcloth with hot water for continuous relief. Then gently massage the eyelid. Make sure to do this a few times a day for optimal results. Time: It is often said that time is the best remedy, and while it does not apply to every condition, it does apply to treating styes. 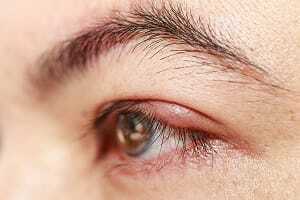 Leaving the stye alone without trying to pop it or squeeze it can be the best way to go about the situation. By squeezing, you run the risk of spreading the infection. Teabag Compress: Instead of simply using a heat compress, you can expedite the process of healing by using green teabags. Green tea is a great addition to the hot water compress as it reduces swelling and has antibacterial properties. Place the teabag compress over your stye for over 10 minutes a few times every day, until the stye is treated. No Makeup: Keeping makeup away from your stye is very important to avoid further irritation and delay the recovery process. Our eye doctors at Valley Eyecare Center also recommend that you throw away any old makeup as it can be a breeding ground for bacteria and lead to future styes and other eye conditions. For more information about styes or to schedule an appointment with one of our eye doctors, visit our website.